Weekly pop-up outdoor community art event in the centre of the New Forest, Hampshire. Art in the Yard is a new outdoor community art initiative for viewing a wide variety of work on display by local artists from our central location. 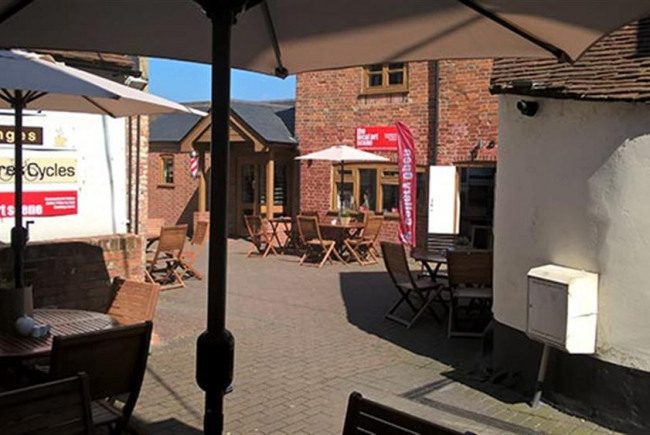 Art in the Yard will be sited in a privately-owned courtyard in the centre of Lymington, New Forest. Each event will be held on a Sunday when the other premises are closed, so that we can make full use of the space available. The courtyard is located on the High Street with rear access via the town's public car park. Art in the Yard is your opportunity to celebrate the wealth of talent in the local area and for local artists to get involved in our community art project. The event promises to bring together a wide variety of art including original artwork, ceramics, woodwork, glassware, photography and demonstrations by local artists. The event will be able to accommodate up to 20 artists per day. 16 artists hanging paintings on 8 x Heras construction fences and 4 artists displaying ceramics, sculpture and wood on tables. The venue and event will be unique to the area, as there is nowhere in the South where local artists can display their work on an ad-hoc basis at a specific event where artists of all calibres will be accepted without prejudice. Art in the Yard is a pop-up event, run on a pay and display basis when weather permits. The event will run predominantly on a Sunday, but we can also accommodate artists on weekdays during the summer months. The courtyard's central location with ample parking to the rear is the perfect location for this local art event. Art in the Yard supports hArt - Creative Ways to Support Mental Health 25% of the profit from pitch fees raised from each event will go towards supporting the local charity hArt. hArt is a young Lymington based charity offering creative ways to support mental health needs in people of all ages and at all levels. We offer a wide range of activities from art workshops for families through to therapeutic one-to-one and group work for people with very specific and complex needs. Our aims are to to use indoor and outdoor spaces to encourage self expression and self care for health and wellbeing and to bring people together around creative activities for friendship and community connection. I am the owner of The Local Art Scene. I operate the business as a social enterprise aimed at supporting both local professional and amateur artists of all mediums from acrylic, watercolour and oil painters to sculpture, woodwork and jewellery makers. The Local Art Scene was created in response to the need for artists to be able to represent themselves, their work and events both nationally, and in their own immediate location. The website is designed to clearly direct the visitor to local artists, art galleries, suppliers, exhibitions and events in towns and cities across the UK. The Local Art Scene is a great way to reach out to art buyers, galleries and customers in your local area. Project Delivery Manager: Trevor Hart The Project Delivery Manager takes legal responsibility for receiving and spending the funds raised and ensuring the project is delivered.